A Pennsylvania appeals court has refused to release the rapper from prison. Meek Mill has been denied bail by a Pennsylvania appeals court for the second time, Billboard reports. The denial follows Judge Genece Brinkley denying the rapper's request for an emergency bail hearing on Monday, December 4. 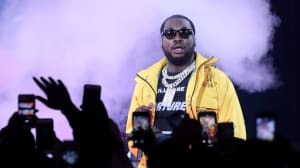 Records seen by Billboard show the state’s Superior Court denied a request to free meek on bail on Wednesday, December 6. Attorneys say they’ll continue their efforts to free him. Meek Mill was sentenced to a prison sentence of between two and four years in November for violating probation on a gun and drug case dating back almost 10 years. According to court documents provided to The FADER, the rapper's lawyers have filed an additional appeal for the recusal of Judge Brinkley from the appeal case, citing an FBI investigation that dates back to 2016.